Maheswari sarees holds its history from the 18th Century. Queen Ahilyabai Holkar ordered various craftsmen and artisans from Malwa and Surat to design a special saree which later came to be known as Maheswari sarees. The sarees were given as special gift for the royal relatives and guests. This Maheswari Cotton Silk Brown colored saree has beautiful multi colored border and pallu. The Maheswari sarees are made using natural vegetable dyes. 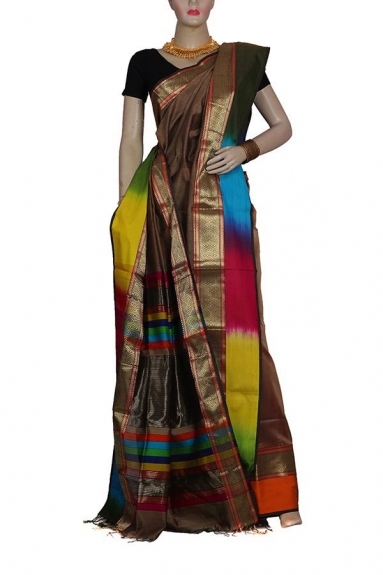 This saree is a perfect choice for all festive occasions in your life.